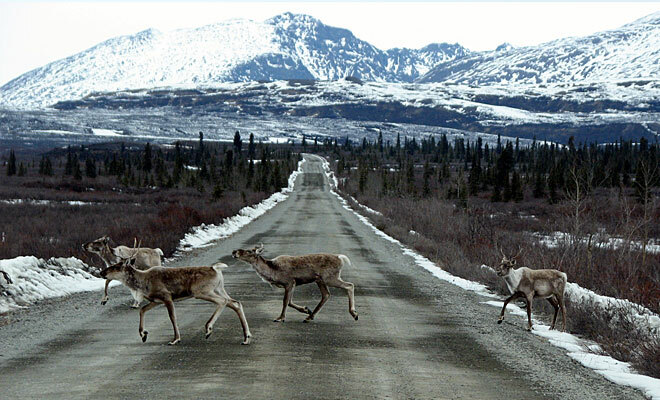 While the highway opened in 1957 as the first road to allow access to Denali National Park, the history of the road as a route of adventure through the wilderness is a fabled tale in the history of Alaska. 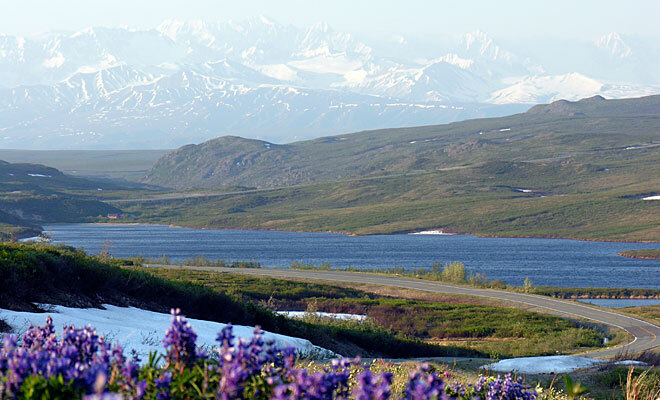 Traveling the Denali Highway today is truly a path through awesome wilderness that links travelers to Alaska’s prehistoric past and gold rush history. 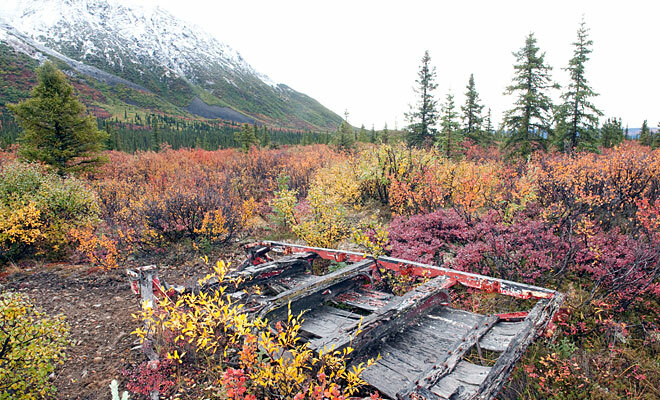 The official and historical start of the Denali Highway is in Paxson, where it branches off from the Richardson Highway. The first 21 miles of the road are paved, and the entire 135 miles is two lanes wide. 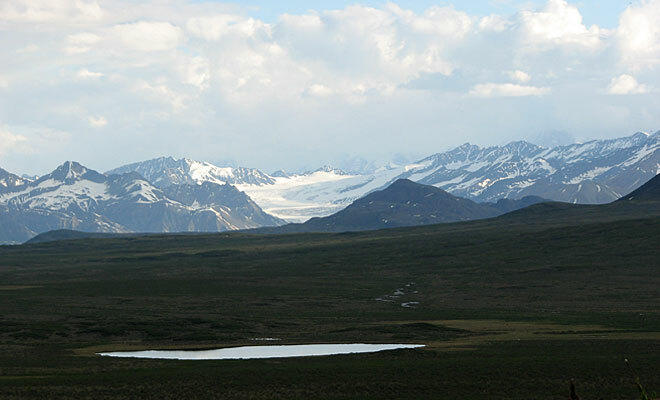 The route quickly climbs from the boreal forest to access the tundra and taiga along the foothills of the mighty Alaska Range. 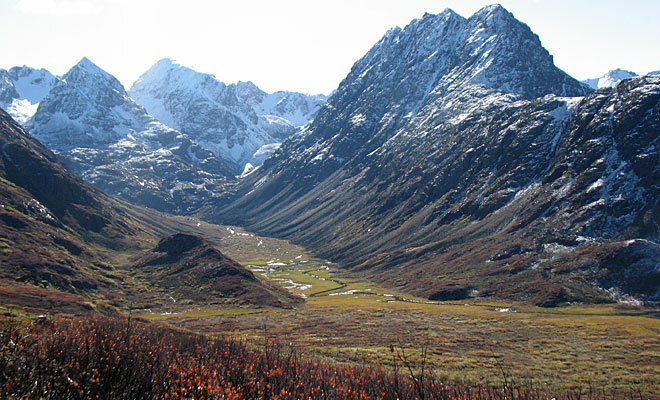 From the Paxson elevation of 2,750 ft., travelers eventually climb to the Maclaren Summit at 4,086 ft., the second highest road pass in Alaska. 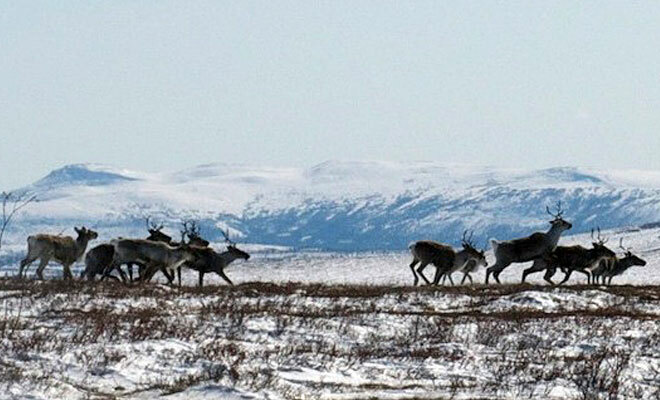 Mile 0 to 5: A sharp ascent from forest to taiga to tundra. Mile 5 to 20: Stunning views of mountains and vast stretches of endless wilderness. 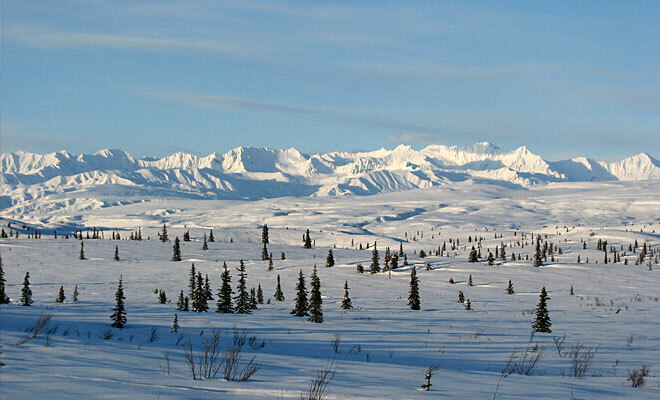 On clear days views of the Wrangell-St.Elias peaks and the Chugach Range are also possible. Mile 20 to 24: The Tangle Lakes region. With their backdrop of the Alaska Range and the outlying forepeaks called the Amphitheater Mountains, and bounded by glacial eskers, these are some of the most beautiful lakes on the planet. Pavement ends at the Tangle River bridge at mile 21. Mile 24 to 37: From the beautiful Tangle Lakes region, travelers traverse the Amphitheater Mountains and arrive at Maclaren Summit with breathtaking views of the Maclaren Glacier river valley below. Mile 37 to 56: The road descends a long grade to the Maclaren River valley, accompanied by spectacular views of the Maclaren and West Maclaren glaciers descending from 13,832’ Mt. Hayes. West of the river, the highway passes through a narrow defile called Crazy Notch, after which there are a series of shallow lakes on both sides of the road, until arriving at the aptly-named Clearwater River. Mile 56 to 79: Much of the road is built atop glacial eskers – sand and gravel-rich ridges marking where glacier-bottom rivers once flowed. The highway skirts the southern nose of the steep, barren and dramatically-topped Clearwater Mountains until arriving at the Susitna River, with its 1,000-foot long bridge. Mile 79 to 103: A gradual rise out of the Susitna River drainage, with expansive views across Monahan Flats to the central Alaska Range, including Susitna and West Susitna glaciers. 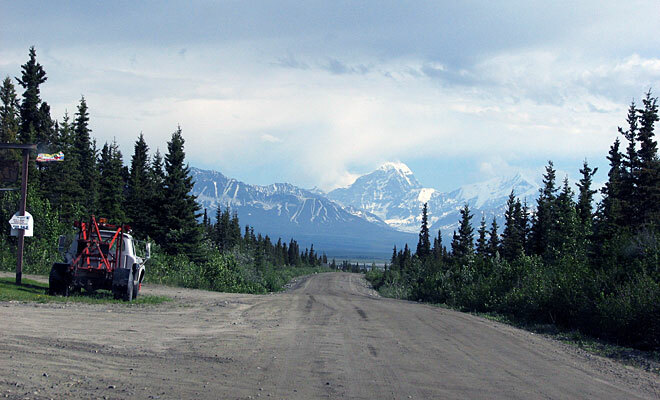 Mile 103 to 132: Descent into the Nenana River valley and entering boreal forest, with close-up views of the northernmost extension of the Talkeetna Mountains. Pavement begins. Mile 132 to 135: Road passes through settlement of Cantwell, and terminates at mile 210 of the Parks Highway, 27 miles south of the entrance to Denali National Park. In essence, travelers can expect fantastic mountain views; endless wilderness with very few signs of human impact; a sense of isolation and quiet that is increasingly difficult to find; and potential animal sightings along with songbird and waterfowl species. Of the 135 miles of the road, the first 21 miles on the eastern end, and first 2 miles on the western end, are paved. The rest of the road is gravel, not dirt, hence there effectively are no stretches of mud but there can be sharp rocks. Because of potential sharp rocks, you SHOULD LIMIT YOUR SPEED TO 35MPH! In places, a lower speed is prudent. Do not take the “highway” in the name literally. At times you may think the road surface is great, but conditions can change in an instant. Again, please do not drive over 35 and do not allow someone to drive who cannot heed to this limit. Why rush? Spend your time enjoying the scenery rather than changing tires. If you think this speed is unbearably slow, or you find a dusty, bumpy road to be annoying, this is not the road for you. Those used to driving rural farm roads in the US will find the highway a pleasant journey. Guidebooks, some websites and many online travel forums often have out-of-date information on the conditions of the road, or may enjoy being melodramatic and giving a scare to other travelers. Since 2006, the Department of Transportation has invested lots of time and money annually on the maintenance of the road. Just remember: Princess Cruises runs between 10 to 15 tour buses every week across the Denali Highway and they wouldn’t routinely endanger their luxury buses on a dangerous, ill-maintained road. This route is NOT mountainous driving. Travelers can expect easy, gentle inclines with safe visibility. The road is cleared of snow from approximately mid-May to the beginning of October. 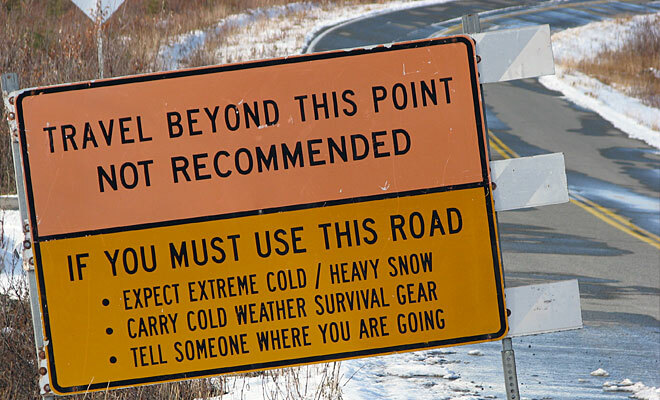 If you are traveling in the shoulder seasons of late May or late September, please call us or the Department of Transportation (toll-free in Alaska: 511 or outside Alaska: 866-282-7577) to verify the road is still passable. 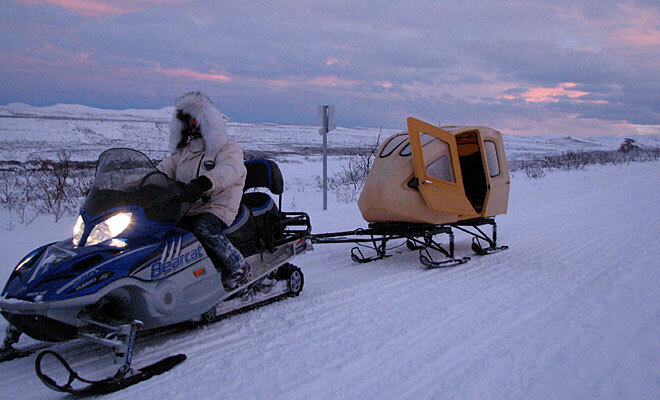 All other times of the year, only snowmachines and dogsleds access this beautiful route! If you have any tire problems along the way, tire repair services are located every 20 to 40 miles along the route at various roadhouses. 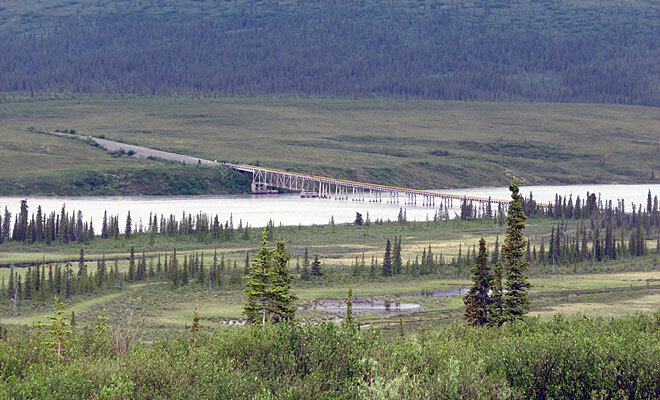 Many rental car companies will prohibit driving the Denali Highway, but a number of companies do allow travelers to take their cars on this road. A few companies travelers should inquire to are: Go North Travel Center and Midnight Sun Car & Van Rental. Also do verify restrictions with the major national companies, as they often change their rules from year to year. Please note: we have no financial incentive to misconstrue the conditions of the road as the majority of our visitors (& potentially all visitors could) reach us via the Richardson Highway. We simply love this road and encourage independent-minded, adventurous travelers to enjoy it! NOTE: Bring your binoculars to Alaska! Animals are usually not next to the roadway. 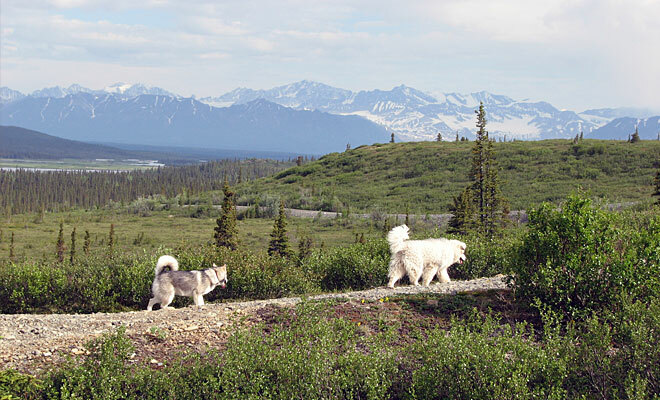 In Denali Park, animals are habituated to human presence, especially vehicles, hence folks get good views of animals next to the road. 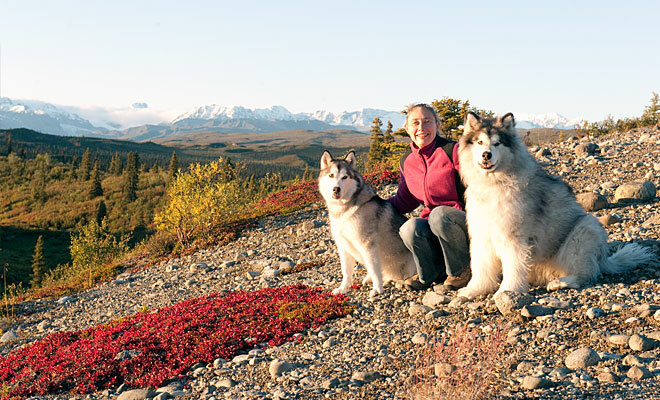 But the Denali Highway is a true wilderness region where the animals have a natural, healthy avoidance of human presence, therefore you must work to see them. We’re often astonished at the number of people who cross the road and complain they didn’t see anything. It’s obvious they’ve been driving too fast (don’t go over 35 mph!) and only looking at the immediate area next to the road. 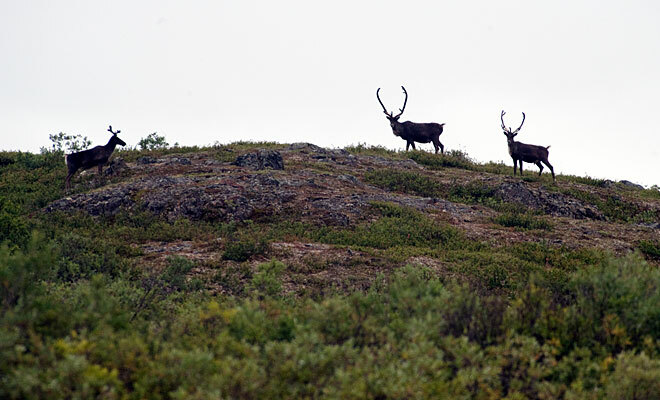 Stop, take breaks, enjoy the wilderness and focus your binos up on the hillsides. One of our favorite evening activities is to go “spotting” up the road. We take binos, look off in the distance, and we’re rarely disappointed. The animals are out there, but sometimes you have to work and look to find them: it is not a zoo.